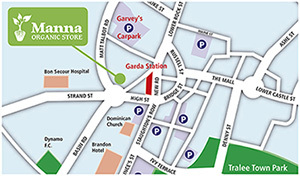 Our Shop is in a large building set back from the roundabout between the Garda station and the Bon Secours hospital in Tralee. We have parking out the front which is sometimes patrolled by a car-sensing barrier, please do drive in (it lifts in 10 seconds). Manna Organic Store, Island of Geese, Strand Street, Tralee, County Kerry.